Our spiritual lineage began some 5000 years ago with the 28th incarnation of Lord Shiva, who incarnated as Lakulish according to the prophecy recorded in the Shiva Puran, Shatrudra Samhita (v:43-50), of the ancient Indian scriptures: "During the twenty-eighth Dwarpar Yuga, when Dwaipan, son of Parasar shall be Vyas and Lord Vishnu shall incarnate as Lord Krishna, son of Vasudev, I too shall incarnate in the body of a celibate and shall be known as Lakulish." This prophecy came to pass nearly 4500 years ago, when Lord Lakulish appeared on earth at Kayavarohan,a well-known pilgrimage center in western India. He preached the principles of sanatan dharm (eternal culture) and the spiritual science of Divine Yoga. His spiritual tradition flourished for nearly 3000 years. But with the passage of time the teachings of his tradition ceased. However, this timeless Divine Being revived his spiritual tradition afresh when he initiated Swami Pranavanand in 1913 A.D. Pranavandji initiated Swami Kripalvanand in 1931, installing him as a Yogacharya (teacher of Yoga) and the third kulguru in His new lineage. In turn, Swami Kripalvanand initiated his chosen disciple, Swami Rajarshi Muni, in 1971 and passed on to him the profound mysteries of Divine Yoga. Swami Pranavanand is considered to be the second guru of this lineage. He spent his sannyas life period in the secluded practice of Divine Yoga and meditation as befits the highest class of Sannyasi in search of final salvation. Instead of becoming a preacher he spent his life in the study and practice of the priceless knowledge of Yoga received from his Divine Guru and attained a very high stage of progress. He conquered hunger and thirst, a major accomplishment in the spiritual practice of Yoga before leaving his mortal coil in Rishikesh in 1930. On the day following his eighteenth birthday, broken by disappointment and determined to commit suicide, Saraswatichandra, the young man destined to become the great saint Swami Kripalvanand, stood in worship during the evening prayers at his favorite temple near the pigeon house of Bhuleshwar. It was the festival of utarayan. All other devotees departed on completion of the evening arti. Saraswatichandra lingered there. An unknown saint in ochre robes approached him and asked him to come to his ashram the next day. The boy did as he was told and thus, on 15th January 1931, placed himself within the folds of the disciplic tradition of Lord Lakulish, of which he would in future become the third Kulguru of the Lakulish lineage. The unknown saint was non other than Lord Lakulish, himself, in disguised form. Having received Yoga Diksha and having been explained the profound mysteries of Divine Yoga by Swami Kripalvanand (Bapuji) in 1971, following the death of his Guru, Swami Rajarshi Muni became the present Guru of the spiritual tradition founded by Lord Lakulishji (Dadaji). The first spiritual initiation in this lineage having been given by Lord Lakulish himself, its origins are divine. All the Gurus of the Parampara (Tradition) have been instructed in the profound mysteries of Divine Yoga and thus the knowledge and practice of Yoga preserved and practiced in the lineage is of the highest order. Like his Guru, he too had an interest in abstaining from all external activity and pursuing his Yoga sadhana in seclusion. 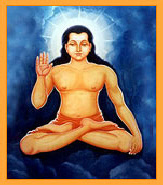 He was in fact so exclusively engaged, but on February 15, 1993, Lord Lakulish appeared to Swami Rajarshi Muni in his Divine form for the two-fold purpose of providing him guidance in his advanced Khechari Mudra phase of his sadhana and also to give him a Divine Command to be an instrument in the revival of the Sanatan Dharma Culture throughout the world. See Divine Command. Since 1993, Swami Rajarshi Muni has been immersed in undertaking and fulfilling Dadaji's command. He formed Life Mission, a nonprofit organization, for that precise purpose and has worked tirelessly, travelling extensively across India on its behalf. His accomplishments have been as monumental as his efforts in fulfilling Dadaji's command. Swami Rajarshi Muni has authored over 100 books on Yoga, some of which have very fortunately been translated into English. For example, some of his current titles available on this website, go to Shopping are also available on Amazon.com/. They are: Classical Hatha Yoga; Divine Body; Infinite Grace... the Story of My Spiritual lineage; and Tenets for the Spiritual Life.